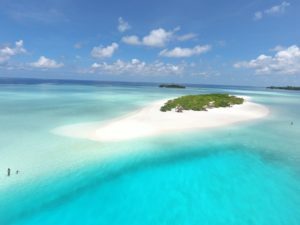 In 2010, when I was working as a scuba dive instructor in a resort on the Maldives I was wondering why it´s not possible to travel the Maldives in a cheaper way. There are many divers out there who don´t need the luxury of a 5-star resort. 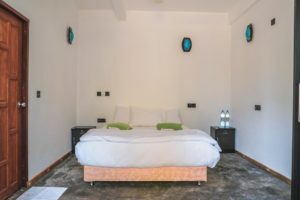 Not being able to book a bed in a basic accommodation like a homestay, hostel or guesthouse, prevents them from going on a scuba dive holiday to this amazing dive destiny. 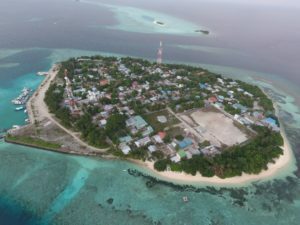 Recently, I figured out that there are some local islands on the Maldives where guesthouses and homestays have been opened. This makes it possible to travel the Maldives on a budget and experience the local culture! I decided to check it out for my fellow ´splashpackers´ and share my experience about it. In all my time working as a diving instructor in 4 different continents and travelling to and diving in more than 10 different countries, the dive site of Madivaru Corner on Rasdhoo Atoll is still the best dive I ever did in my life. 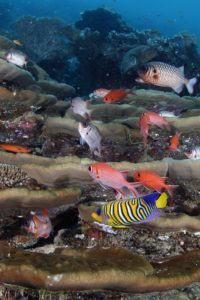 The dive is so complete with always many white tips sharks, grey reef sharks, eagle rays, napoleons, leaffish and mantis shrimp (stomatopoda) among other sealife, reef dwellers and macro life, that I think every scuba diver will be satisfied to dive that site. 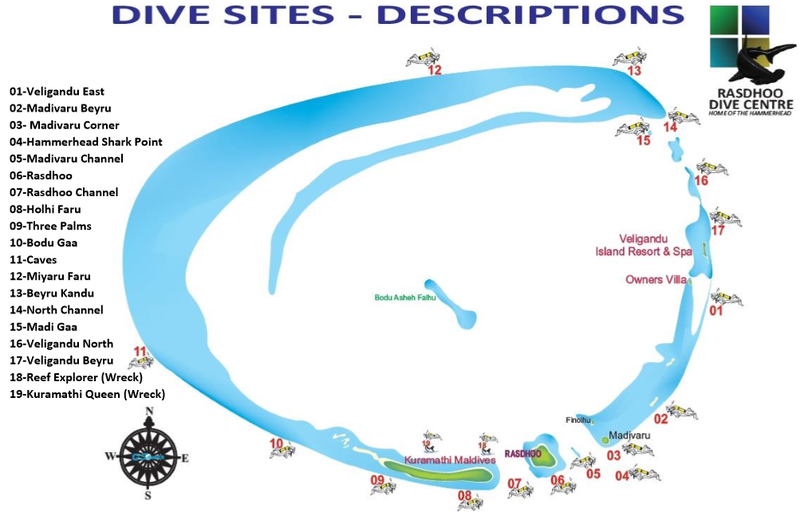 But not only Madivaru Corner, there are more than 19 dive spots on the atoll of Rasdhoo and they all offer spectacular diving. I was never bored when I was working as an instructor here and now I became curious to stay on a local island. Rasdhoo Dive Centre offered me to stay a few days in their dive lodge and experience the diving with them. 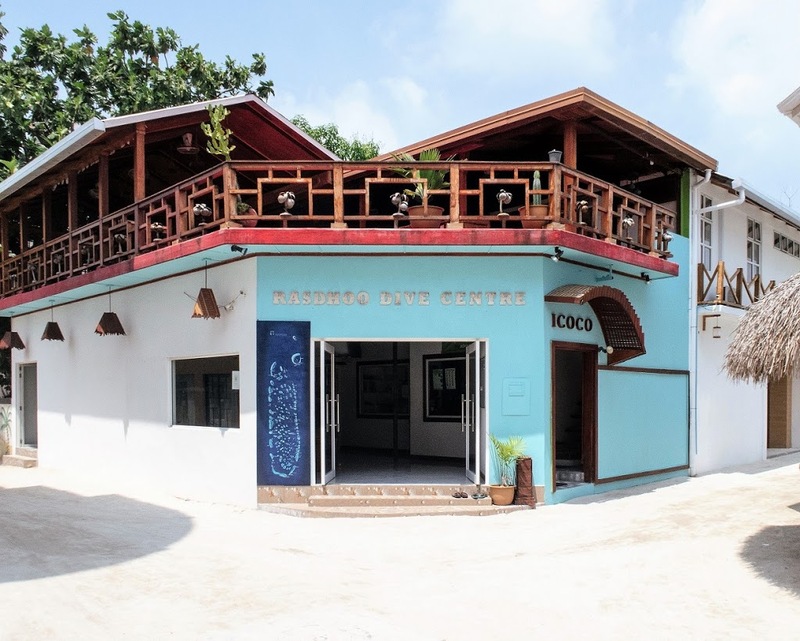 The first thing I noticed was how well this dive center and the belonging accommodation and restaurant are developed in comparison to other homestays, guesthouses and dive centers on this island. Everything looks very new and I think staying with them can more be considered more like a flashpacker style than a backpacker stay. There is a big team of staff available who all are super friendly and helpful. After my check-in to a very clean, spacious and comfortable room, I got showed around the complex. Comparing this to previous budget accommodations on my travels, the air-conditioned room with coffee and tea facilities felt as a complete luxury treat to me. 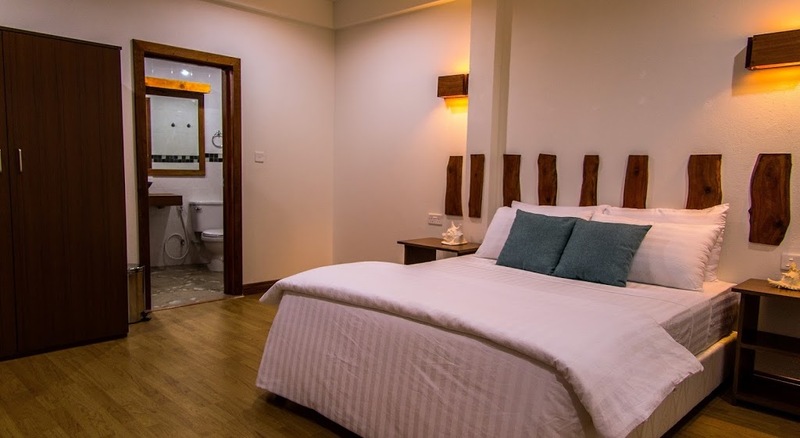 There are 8 rooms in the dive lodge and there is an option to choose between different price categories and rooms with or without balcony. Outside are some nice seating areas to enjoy social time with your fellow divers or the dive staff. I think the divers lodge is a nice place to meet other divers as a solo traveller, a couple or a group of divers. 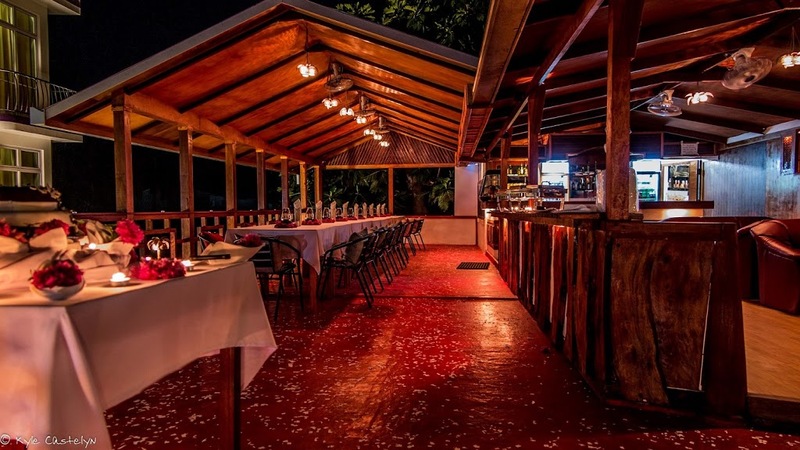 The belonging restaurant is located on a roof terrace and offers nice freshly prepared meals. Click here to find more information about the Rasdhoo Dive Lodge. The dive centre looked clean and very well organised. After filling out the required paperwork, the dive equipment got put together in my box and I was ready to go diving the next day. The next morning I enjoyed my breakfast which was served in a buffet style. I joined the table with other divers and some of the other dive staff and enjoyed my breakfast whilst having a nice chat. At 08.30 am we left the dive center and walked the few hundred meters to the shore where our big dive boat was waiting for us. The first dive we did was Madivaru Corner and the current was a right-hand shoulder one, which is good. 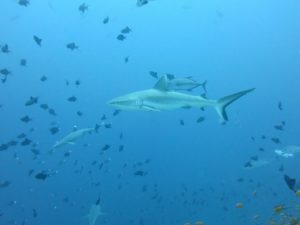 Even though the dive site is also amazing with a left-hand current, if the current comes from the right a shark show can almost be guaranteed. 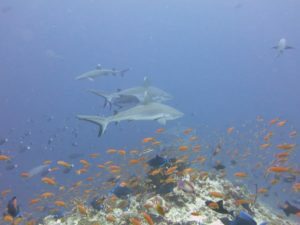 Upon descending we saw some white tips sharks and grey reef sharks in the blue while we followed the reef at about 18 meters. A stonefish was hiding between the rocks just before the big part of the wall ended and we started to follow the reef. Here, we continued the dive whilst leaving the small remaining reef wall at our left. We found some smaller marine creatures like another stonefish, nudibranch and morays on the reef, we spotted an eagle ray and a white tip shark swimming by in the sandy patch to our right, while in the big blue at our left the shark show was just going to start. During the dive we could feel the current becoming a bit stronger and with it more sharks appeared. We hovered above the smaller reef wall while not knowing where to watch. The blue was full of white tips sharks and some grey reef sharks while in the sandy part from time to time, some bigger fish decided to show itself from that side. ´Do I really want to take a photo of that Napoleon on that side, or shall I continue watching the sharks? Oh there´s a group of 12 eagle rays above us too.´ This is exactly how I remember Madivaru Corner and the reason I came back to dive here. I think, comparing this dive spot to 7 years ago, the marine life here has only improved which is very unusual in other places in the world. We continued our dive over the reef plateau where more morays are to be spotted. Sharks kept appearing in the blue and we also spotted another ray. Our guide was very good in spotting smaller stuff and showed us a leaf fish and a nudibranch. This dive site is just an all inclusive one! 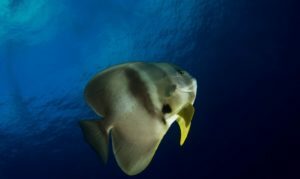 Big groups of batfish are hanging above the reef and you can just be surrounded by them because they are not even considering of moving out of the way for us. At the same time the surgeonfish are happily playing with our bubbles, while we are making our way up to do our safety stop. During my surface interval I was having a nice chat with the staff of Rasdhoo Dive Centre and my dive buddy. At first, my dive buddy booked in for only one dive and was going to be brought back to the dive center. However, he changed his mind by being so impressed by the diving here. When we saw a few plastic water bottles floating in the ocean, the dive crew and me jumped into the water to collect them. For our second dive, we first jumped at Madivaru Corner where the shark show was still going on. After watching more of these amazing creatures, we decided to follow the reef in the direction of the channel, Madivaru Channel. Sometimes, even more interesting sharks like silver tip, blacktip reef sharks or even hammerheads can be seen here. But to really see the hammerhead sharks, you can sign up for the early morning deep dive called ´Big Blue´ which is especially organised to see these ocean friends. This time we spotted a stingray laying in the sand and also a turtle having a rest on the reef. When it was time for our safety stop, I again realised how amazing this dive spot is. You can see so many things at one place, I think it´s a dream for many scuba divers. 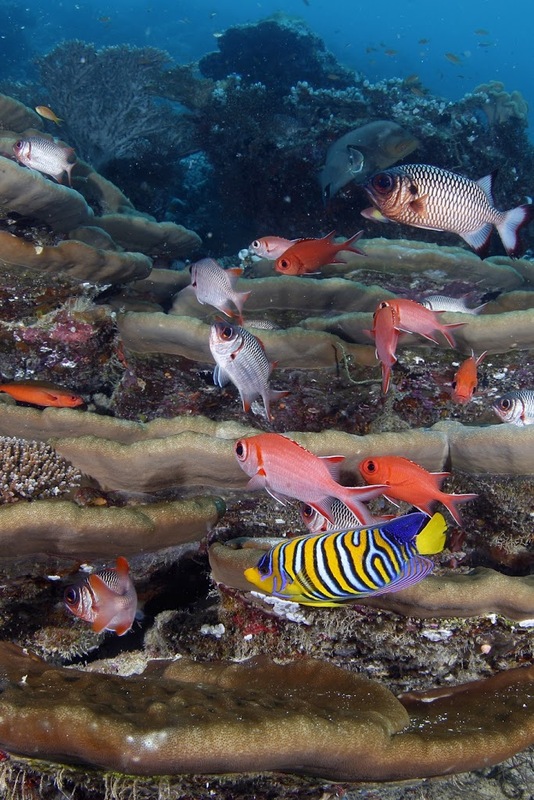 Rasdhoo Atoll offers more than 19 dive sites giving home to a variety of marine life and each dive spot is unique. 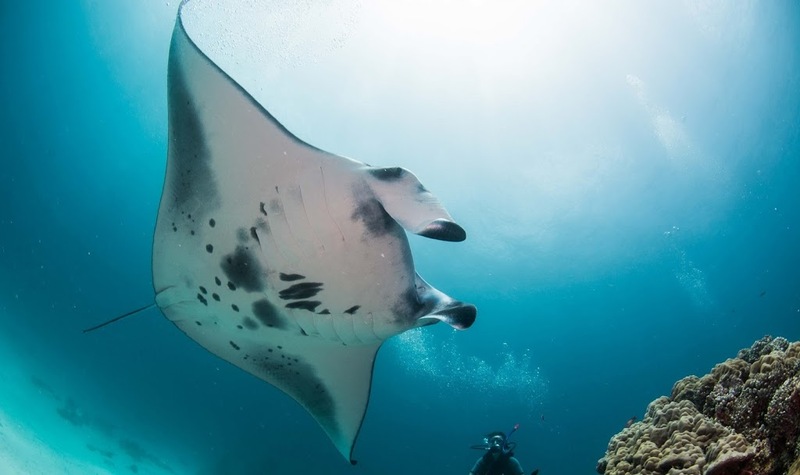 Manta rays can be seen at Manta Point where is a manta cleaning station and the best time to go there is from November till April. Other dive sites includes tilas, wall dives, reef dives and wreck dives. Things to see on a regular base and other than I already mentioned above include ghost pipefish, shrimps, lobsters, different species of sharks, a variety of rays and much more. 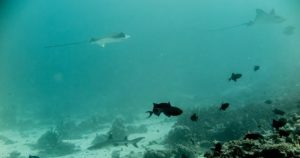 There is a ribbon eel to be spot at the dive site Kuramati Tila and I also heard from other diving instructors that the tresher shark, the guitar shark and even the whaleshark have been seen during scuba diving Rasdhoo Atoll. Working as an instructor myself on this atoll, I also have seen dolphins and the ornate eagle ray. Day trips to do scuba diving on another atoll can be organised if enough people sign up. You need to be an advanced diver for these trips and they go out for 2 or 3 dives, located at about 2 or 3 hours by boat. One of the places they do is called ´Fish Head´, located just in front of the resort island ´Safari Island´ which is an amazing dive site with an abundant fish life and it gives home to many turtles. I dived this spot myself and enjoyed it a lot but there are also other amazing dive sites to be done on a day trip. 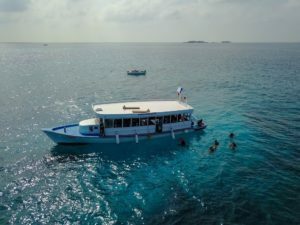 Also, soon Rasdhoo Dive Centre will offer liveaboard trips for a few days to explore nice dive sites around the Maldives. The early morning dive to see the hammerhead sharks and night dives can be organised upon request and can be done almost any day. 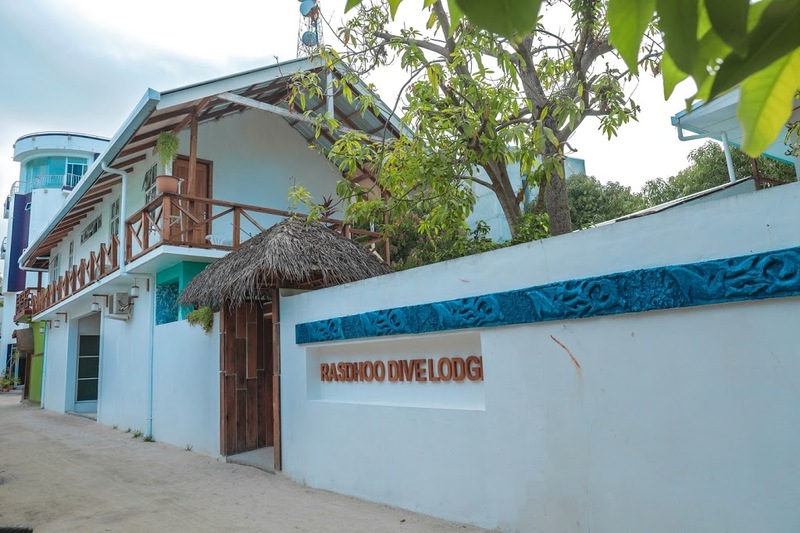 The travel and diving industry on Rasdhoo is still developing but in contrast to most other accommodation and dive centers on this island, ´Rasdhoo Dive Centre´ is the most developed. 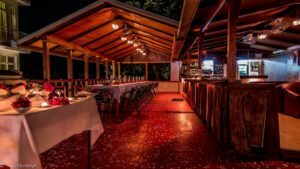 They were the first dive center on Rasdhoo Island and with their nice dive lodge and roof top restaurant, they can offer you a complete all inclusive package for your diving holiday. It is a great place to meet other divers and the staff is extremely friendly and chilled while at the same time very professional in regards to scuba diving. You will feel comfortable from the first minute you arrive. All the staff of Rasdhoo Dive Centre shows a big passion for the ocean and practise good ethics not to disturb any marine life. They also organise beach clean ups and clean the close by laying sandbank. The manager of the dive shop is having plans to start a coral replanting project too. I spoke to the owner of the dive center who showed a big enthusiasm for the environment. He will also be organising more projects to keep the oceans clean in the near future. 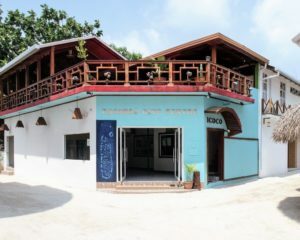 Rasdhoo Dive Centre is also a member of Green Fins. In my experience, the level of service and professionally are similar to the ones in the expensive resorts on the Maldives. At Rasdhoo Dive Centre the equipment, compressor and maintenance rooms are extremely clean and organised, also there is a high quality compressor from the brand Bauer. 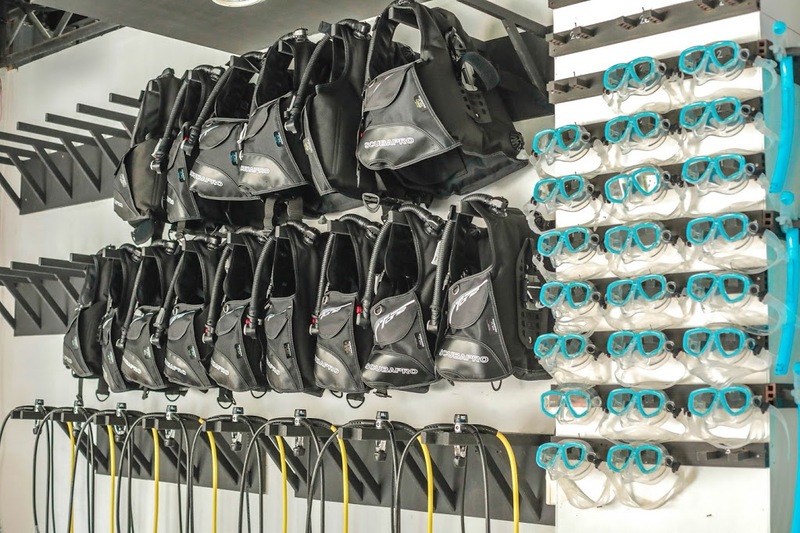 All rental equipment is available and everything looks brand new, all from Scuba Pro. Soon, Nitrox will be available too. Rasdhoo Dive Centre is diving from a big boat with a lot of space for tanks and equipment, there is a toilet on board and a sundeck to chill out during your surface interval. Next to the professional and relaxed dive staff, the boat crew is also very helpful and friendly. 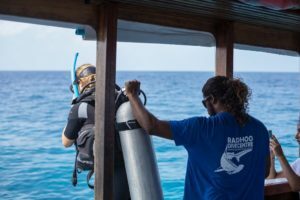 For these questions coming in through the Splashpacker site before: Yes, now it is possible to do your divemaster course on the Maldives! Staying in a resort is not likely to be affordable but staying on a local island makes it possible to do your divemaster course on a world class dive destination. Rasdhoo Dive Centre can make a package for your dive master internship, contact me directly for more information. 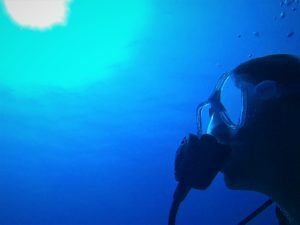 The dive center is also looking into becoming an IDC centre in the future. 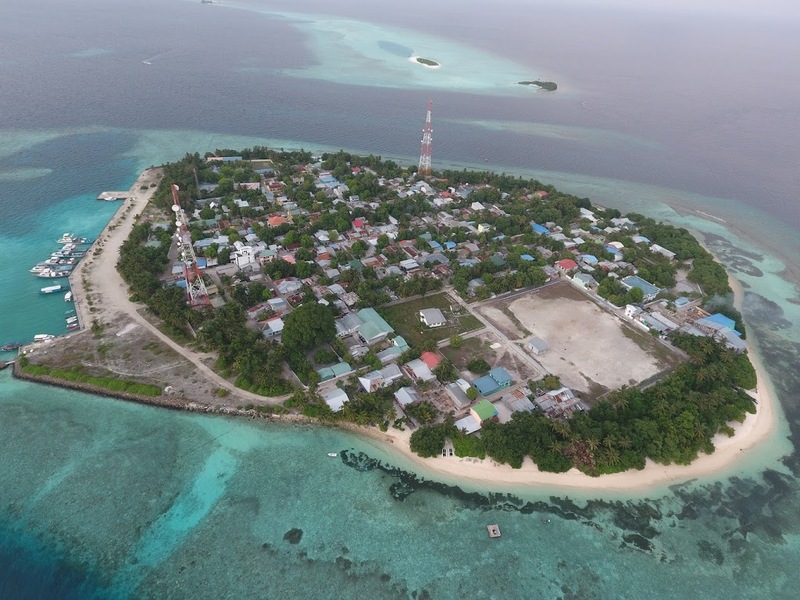 Do you want to go on a diving holiday to Rasdhoo Island? 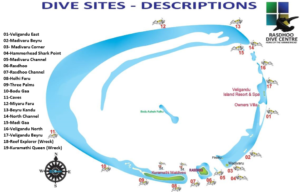 If you´re interested in scuba diving with Rasdhoo Dive Center, contact me for any information or reservations. Full all-inclusive packages can be booked but if you like to plan your own travel you can also book the speedboat ferry, accommodation, food and diving separately. You can also find more information by clicking on this link to contact them directly. 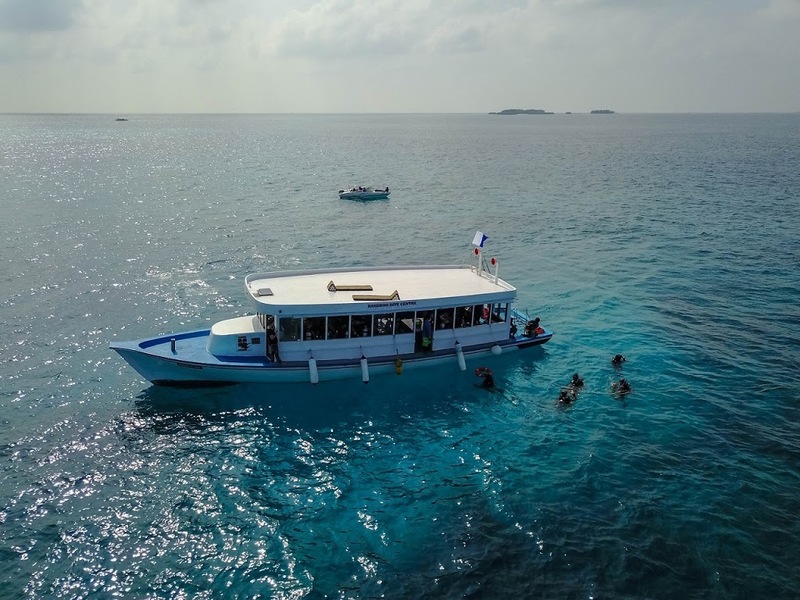 More dive- and travel information about the Maldives will follow..
As you probably already have realised, I´m very excited about this new local and budget concept on the Maldives. I already visited another local island, Ukulhas, where guesthouses and a dive centre offering holiday packages, making it possible to do some island hopping and include more Maldivian islands in your stay. Also I´m working on a more general article about travelling the local islands of the Maldives with more details and information. Stay tuned and keep an eye on the Splashpacker website or follow me on Facebook. Thank you, Rasdhoo Dive Centre!! A big thanks to Rasdhoo Dive Centre for making local holidays on the Maldives now available to all of us and so that those on a lower budget can also enjoy the scuba diving of the Maldives without needing to stay in a luxury resort. Rasdhoo Dive Centre has also provided me with all of the photos in this article and another thanks for inviting me to stay and dive with them. Very happy bubbles from the Maldives! blogosphere. Brief but very accurate info? 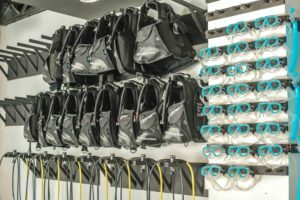 How to become a scuba dive instructor?